This machine was seen at the RAF Leuchars Air Display c1988. It was here along with the Dodge K series I posted earlier. 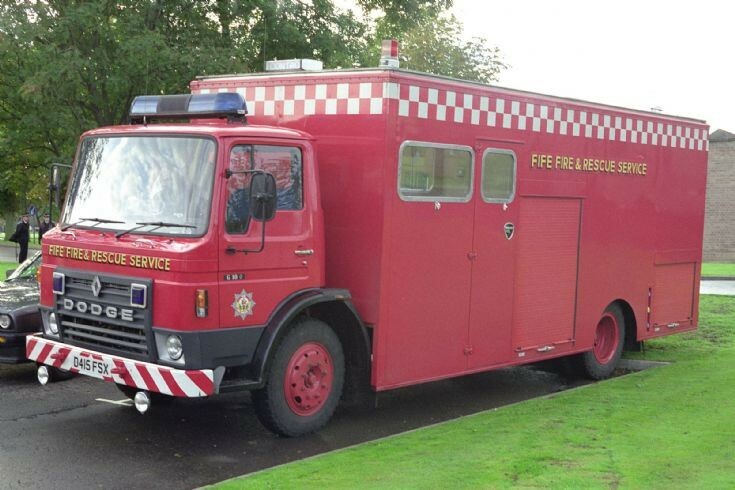 This is a 1986 Dodge G10C/M&T/FF&RS Control Unit(M&T-Methven&Thomson)of the Fife Fire & Rescue Service and was allocated to Brigade Headquarters at Thornton,Kirkcaldy. Added by Pete Matten on 30 November 2009. Did this end up in Ireland ? Added by Scally on 05 September 2011. I have no reason whatsoever to believe this one went to Ireland - what makes you ask ? Added by Ian Moore on 05 September 2011. Fife's BLS743V, 1980, Dodge G1313, Fulton & Wylie did end up in Ireland. Added by Petros on 04 December 2018.